Other mistake: At the beginning of the scene when Rocky's statue is unveiled and Clubber Lang challenges Rocky to a fight, the camera zooms out of one of the drums that is being played and it is easy to spot that Mr. T's signature is scrawled right across the centre of the drum. Revealing mistake: When Mr. T and Rocky are about to fight for the second time, the camera shows a view of the crowd, if you look closely in the top left hand corner there is a billboard with Rocky and Apollo with superfight 2 on it. This is a scene from Rocky 2. Deliberate mistake: In one fight scene, the word "Clubber" that is written on Mr. T's shorts is reversed. It is a flipped shot. Revealing mistake: In what is supposed to be an emotionally significant scene, Apollo offers his USA style boxing trunks to Rocky for him to wear in the upcoming rematch with Clubber. Problem is, there is one flashback scene when Rocky is training with Apollo that shows Clubber hitting Rocky with a body shot. You can see the top two or three inches of Rocky's trunks below the waistband and it is clearly the red, white, and blue trunks. In fact, the scene is from the second fight. You can see it in normal speed later. Visible crew/equipment: The last scene, between Rocky and Apollo is full of visible crew/equipment. First, when they're talking, you can see in the left-bottom corner of the screen a shadow moving. When Rocky and Apollo are talking before they fight, you can see on the ground the shadow of the cameraman. And when they start walking in circles and the camera moves with them in circles, you can see a crew member that watches them talk. Continuity mistake: When Rocky is knocked out during the first fight with Clubber, he falls to the canvas in slow motion. From one angle he has both arms hanging down and his face is about to hit the canvas, but from another angle his arms are bent, so that he won't hit his head as much when he hits the canvas. Plot hole: In the locker room scene after Rocky's loss to Clubber, we see Mickey take his last breath and Rocky lays his head on him and starts crying. Doctors were present, wouldn't some effort of CPR or resuscitation have at least been performed? 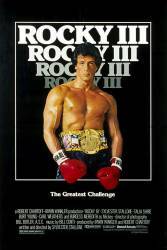 Continuity mistake: Rocky (1976) and Rocky II (1979) are both set in 1976, and Mickey's death in this film takes place in August 1981. However, the newspaper depicting the wrestling match with Rocky and Thunderlips (when Mickey was still alive and in Rocky's corner) gives a date of 1982. Revealing mistake: As the montage showing Clubber's rise to first-rank status is shown, various newspapers are shown detailing certain fights. When the shot of the paper with the article titled "Clubber Lang beats Jaffe in brutal 6th KO", look at the actual writing on the newspaper: It is nothing but about two paragraphs of meaningless, court-room style legal gibberish, and has absolutely nothing to do with boxing in any fashion. These two paragraphs are randomly printed over and over for every article shown on the paper. Continuity mistake: At the beginning of the film when the audience sees some previews of Clubber's continuous victories, look close at some of the shots when you see Clubber swinging, then that punch landing on the other boxers' faces. In at least one instance, Clubber swings with a red glove, but the connecting punch shows a black glove. Continuity mistake: During the wrestling match, Thunderlips knocks Pauly out cold. Two shots later, Pauly is standing outside the ring next to the ring girls. Revealing mistake: During the rematch at the end of the film, Rocky is taunting Clubber with insults, and he reaches up and rubs Clubber's mowhawk a couple times to irritate him. The second time Rocky reaches for the top of Clubber's head, he can't quite reach it and Clubber just stands there and waits for an unrealistically long time for Rocky to reach the top of his head with his hand, and he makes absolutely no attempt to block or counter what surely would have been interpreted as a possible punch by any real boxer. This is certainly not the way any 'World Champion' would react in a real fight. Continuity mistake: When Rocky and Apollo are racing on the beach for the first time, Rocky's hair is dry and blowing. When they show the close-up on him when he's remembering, his hair is very wet and quite a bit shorter and styled a little differently. When they show him far away again, his hair is dry and blowing again. Visible crew/equipment: At the end of the movie during the rematch, a movie camera can be seen filming during several shots of the fight. This is a film camera and not the video type used for news or TV broadcast. Also, it's the only one seen at ringside and the cameraman has an assistant following him the entire time. Continuity mistake: In Rocky's first title defense, he begins the fight with red gloves. Later in the fight they are black, and at the end they are back to red. Continuity mistake: In Rocky's last sparring match before his first fight with Clubber, there are some musicians playing who Mick tells to shut up. The two that you can see behind Mick don't have instruments in the first shot, they do in the next two shots, then not only do they not have insturments again, the two guys have swapped spots. Clubber Lang: I'm gonna torture him. I'm gonna crucify him. Real bad.